It’s been a few weeks now, but we finally got confirmation that a new main series Pokemon game — effectively generation 8 of the series — will be coming to the Nintendo Switch in 2019. Even though the entry-level games Pokemon Let’s Go! Pikachu and Let’s Go! Eevee will be coming later this year, I would argue that most long-time players of the series are much more excited about the next generation game than they are a game that is essentially a remake of Pokemon Yellow with a lot more bells and whistles1I feel like I’m an exception to this rule, as I think that there’s a lot of potential with the Let’s Go! games. That said, I recognize that my opinion is largely biased by the fact that I play Pokemon Go regularly.. There is, of course, potentially a lot to be excited for with a new main series Pokemon game. In the past two generations, we’ve seen The Pokemon Company introduce mega evolutions, Z-crystals/Z-moves, replace the gym system with the trial system, ride Pokemon, plus the addition of a new typing to create additional game balance. Some of these changes are for the better, some are for the worse, but the one thing that’s for sure is that the games will continue to experience change. With that in mind, I thought I’d present five changes I’d like to see in the next generation of Pokemon games. Since we don’t know a ton about what’s coming in a true next generation Pokemon game2As most of the focus is on the two Let’s Go! games at this point., all of the items on my list will be what I truly would like to see added to those games, rather than any thoughts based off of speculation or rumors about the games found online. If the changes you’d like to see in a coming game aren’t in this list, tell me what you’d like to see in the comments. There’s a lot that Pokemon Sun and Moon did really well while trying to rethink how a core series Pokemon game should be played. One of the biggest areas where it fell short was Hau being your primary rival for the series. I get that he’s supposed to be this happy-go-lucky character whose story intertwines with yours as you’re going through the game. That’s great. Lillie is kind of like that too and she’s a great character. But you don’t battle Lillie. And she’s not the main person you have to battle over and over again while being presented with little to no challenge. If Hau was even a little competitive, it’d be fine. 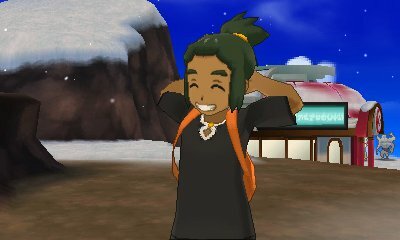 That said, Sun and Moon make beating Hau feel like you’re curbstomping your likeable little brother. No one wants that. We need the jerk rival to return. We need a rival on the level of Gary Motherfuckin Oak. The rivals have been getting progressively easier while also getting nicer. But…why? Make the next rival the schoolyard bully. Or an adult who hates kids because he resents not being able to go on his own Pokemon journey. Just stop giving me this as a rival I’m supposed to take seriously. While there was a bit of an uproar about the fact that Sun and Moon replaced the traditional 8 gym system with the trial system, I will say that I didn’t mind it. The trials were (mostly) better at difficulty scaling than gym leaders were at their place in the game, so it was a bit more of a challenge3Particularly if you went into the trials blind as I did for most of my run through Moon.. The only problem was that the reason the trials were as difficult as they were was because of the SOS mechanic, which forced you to fight the trial’s totem Pokemon two-on-one rather than one-on-one. From a nostalgic standpoint, I love the gym leader system. My favorite characters in the first three games — Sabrina, Whitney, and Flannery — are all gym leaders whose battles I enjoyed taking on. That said, if the gym system could be re-instituted where you have a gym leader you take on after completing a trial-style battle, that would be the ideal situation. It would certainly make for a more climatic encounter than the Captain-less trial in Sun and Moon. I recognize that this is 100% personal bias. I love Ice types. They’ve been my favorite type since Generation I. But good lord are they garbage defensively. There was clearly an effort to try to remedy this with the introduction of Aurora Veil in Generation VII, but one of the major threats to Ice types — fighting type moves — has a direct counter to Aurora Veil in the form of Brick Break. It’s not a soft counter either, it’s the hardest of hard counters, as Brick Break not only removes Aurora Veil, but it also deals super effective damage. So…how do we address it? Perhaps having Ice types resist something other than their own move type4Water and Bug come to mind here.. Maybe give a bulky Ice type an ability like Thick Fat which reduces damage from certain types. There’s also the option of removing the weakness to Rock or Fighting or pairing the Ice typing up with Fire as we’ve discussed before on this blog. Just give me an Ice type that doesn’t have to set up screens or get baton passed stats to death in order to survive. If you’ve only bought the original games in each of the generations of Pokemon5Or if you’ve only played Gen I., you’re likely only lightly familiar with what a move tutor is. The move tutor characters in the main games teach moves to certain Pokemon, either for free or at a cost. The massive problem with this mechanic is that you’re almost forced to wait until the second part of a generation of games comes out in order to take advantage of this feature. Sun and Moon were the main series releases that had the most move tutor moves to date, with 11 possible moves to teach certain Pokemon. Their follow ups, Ultra Sun and Ultra Moon, had move tutors for those same 11 moves, plus an additional 67 moves. SIXTY-SEVEN. Why. Why not have this in the original games? While we’re at it, can we bring back the move tutor mechanics from Black and White 2 where you could purchase move tutor moves with shards rather than needing to rely on doing the battle tree? The battle tree is my least favorite part of Sun and Moon’s post game, as if I want to do competitive battling, I’ll just play online. I get that some people like the feature. That’s great. Don’t tie move tutoring to it. That’s all I’m asking. I can hear the rage coming from the internet now about this item’s inclusion on the list. As much as I liked Sun and Moon, the fact that I could catch so many Pokemon from previous games in the series made me care much less about using Pokemon from Alola, save for my starter, on my first playthrough. That’s not necessarily a bad thing, as knowing the intricacies of my team allowed me to beat the game (Moon) a bit more smoothly. When I did a playthrough of Sun, however, I made an effort to take only Alolan Pokemon as my primary team. The major reason to this change of strategy was that I played Pokemon Black in the middle of these two playthroughs. Generation V forces you to use its regional Pokedex until you beat the main game, only then allowing you access to Pokemon that aren’t native to Unova. I truly think that this forced me to think more about my game experience, which made my run of Pokemon Black much more enjoyable. I’d love to see this brought back in Generation VIII, even if that means Pokemon I love aren’t unlockable until I beat the game’s Elite Four. While we’re at it, if we could have every Pokemon ever in Generation VIII without needing special events to get mythical Pokemon, that would also be nice (though likely very unrealistic). What features would you like to see in a new generation of Pokemon games? Hate or love my ideas? Let me know in the comments.